What is it? A pincer nail, also called a trumpet nail, is a type of ingrown nail. It can form on any nail — fingernail or toenail. By definition, a pincer nail rolls into the skin on both sides of the nail plate. Clients who have the beginning stages of a pincer nail may complain that they feel like something is caught under their nail. As the condition worsens and the nail digs deeper into the skin, the body begins to respond as it would to any irritation. The area becomes red, tender, and inflamed. The nail thickens, and the skin becomes cracked where the nail pushes into it. At times the curve can get so severe, the side edges of the nails will almost touch, causing significant pain. Left untreated, infection can develop. How do you get it? A number of factors can cause pincer nails to evolve. Genetics can play a role, since the natural shape of the nail plate determines how a nail grows. However, many times a pincer nail can develop because of shoes that pinch the toes together or improper maintenance of the nail through cutting or filing. Pincer nails are more common in the elderly, as factors such as diabetes, liver problems, and medication can affect the growth and health of a nail. The elderly and women who are pregnant also pose a higher risk for pincer nails because they may find it difficult bending over to file their nails at a correct angle. How is it treated? Treatment for pincer nails ranges from corrective filing to surgery. Corrective filing allows the nail to grow and widen so the edges don’t dig into the skin. Beyond filing, doctors may choose from a number of other corrective techniques including finding ways to widen the nail. One technique is to cut a “V” out of the center of the free edge. This removes the severe arch of the nail and the hope is that the nail will grow out flatter and wider. 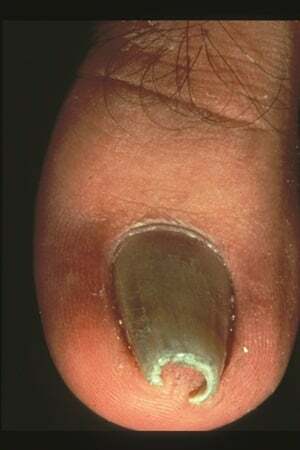 If patients don’t respond to non-invasive corrections, doctors may choose laser surgery or a technique called phenol matricectomy, which prevents regrowth of the nail. In any treatment of pincer nails, doctors may prescribe an emollient, such as Urea 40, to treat dry, cracked, itchy skin or an antibiotic to fight off or prevent infection. What can a tech do? Listen carefully if your client describes a discomfort on the sides of her nails, or if she complains that it feels as if something is lodged under the nail. Make sure you can see the outer edge of each fingernail and toenail and check to make sure they aren’t cutting into the skin. If you notice an inward curve forming, point it out to the client and show her how you’ll file the nail to correct it. If a client comes to you with a fully developed pincer nail, educate her on the situation. If the area is swollen, warm, irritated, or infected, refer the client to a doctor immediately. What else? Another corrective technique used by doctors is to drill a very small hole on each side of the affected nail and thread a piece of wire up one hole, across the nail, and down through the other hole. Once the wire is tightened and secured, it forces the high arch of the nail to flatten, causing the edges of the nail to flair. Again, the theory is that over time, the nail will begin to naturally flatten and widen.